The game industry is expanding at a tremendous rate. Games have been growing in depth and complexity over the past years and have become one of the most popular forms of entertainment, with yearly sales exceeding 7.4 billion dollars. Many innovative developments in new media and ICT arise from the game industry. At the same time there is a huge increase in game-oriented studies at universities and academies. Games have evolved beyond entertainment and have found their way into other applications, such as mixed-media educational programs. The number of games not intended for entertainment is growing fast and has led to a completely new branch in the game industry: “Serious Games”. Serious gaming deals with the educational, medical, economical and political application of games. A Dutch example is GIMMICS, in which multiple teams of students manage a virtual pharmacy for the duration of 4 weeks. Another example are news games, games that are based on news events and that function as a tool for a better understanding of our society. Unfortunately, the vast majority of modern computer games does not meet the needs of gamers who function under limiting conditions. Limiting conditions can be functional limitations, or disabilities – such as blindness, deafness, or mobility limitations. The Game Accessibility Special Interest Group (GA-SIG) writes in its publication Accessibility in Games: Motivations and Approaches (2004) that “between 10% and 20% of the people in a country can be considered disabled.” Information by the W3C seems to confirm this conclusion. Unfortunately, there are no exact figures that describe the scope of the target group. 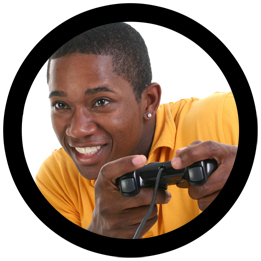 However, according to the Entertainment Software Association (ESA) about 58% of Americans play video games . In Holland (with roughly 7 million households, each consisting of 2.3 heads per household ) this would mean 12.1 million people playing computer games. The percentage of people in the Netherlands with functional limitations and disabilities is 11% , which would imply that the target group consists of at least 1.3 million people in Holland. This estimated guess includes seniors with limitations. Over the past few years several initiatives were launched to improve the accessibility of games. Special games have been developed for specific target groups by small companies and hobbyists. Several academies and universities have shown their interest by using the subject of game accessibility in student projects. The limitations of the target group make such projects interesting, instructive and challenging for students. The International Game Developers Association (IGDA) introduced the Game Accessibility Special Interest Group. In spite of these initiatives, the situation has not improved: accessibility is hardly applied to games and the difference between accessible games and regular games becomes bigger every day. Most game developers are still very much unaware of game accessibility. Developers that acknowledge the importance of game accessibility and want to use it in their designs often don’t know where to start. Games developed in student-projects usually consist of small demos (“proofs of concept”) which lack the quality and (re)playability of mainstream games. This is usually also the case with games that have been developed by small companies and hobbyists. Knowledge about accessible game design that is gained in projects often fails to get documented. Overall, there are too little resources on the subject. The Game Accessibility project has been setup to address these problems by to informing disabled gamers about the availability of accessible games and by providing resources for developers, publishers and researchers in order to stimulate accessibility in games.